By analysing the vibration data from crane gearboxes for a port operator, Schaeffler UK is able to detect any damage to gearbox components early, therefore reducing any costly, unplanned downtime and prolonging the life of the gearboxes. Due to their high utilisation levels, the three cranes at the port are critical pieces of machinery. The cranes are used to transfer containers from ship to shore. Any unplanned downtime of the cranes would cause costly delays to port operations. The port operator concluded that two ageing gearboxes on one of the cranes were beginning to experience high vibration issues. Excessive noise and vibration were coming from the two gearboxes when the crane was going through its lifting and lowering movements. Due to this excessive noise and vibration, the crane was operated at a slower speed, which caused delays to port operations as ships were spending more time docked while they were being unloaded by this slower working crane. Built in the 1960s, the crane is driven by two gearboxes, a left-hand gearbox coupled by a shaft to a right-hand motor-driven gearbox. The port operator contacted Schaeffler UK for help in monitoring and analysing vibration data of gearbox components (i.e. bearings and gears). 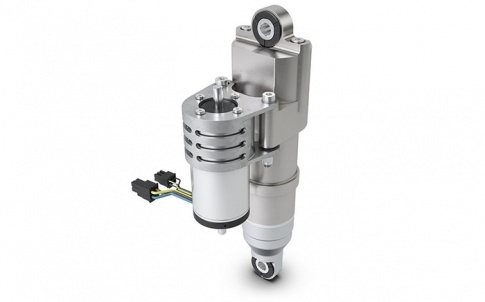 This vibration analysis would help to provide early warnings of any potential damage to the crane gearboxes, which would allow the port operator to schedule any maintenance activity on the gearboxes or replace any damaged gearbox components before they failed. Since 2012, Schaeffler UK has been providing regular (every four to six months), on-site vibration monitoring and analysis services for the port operator. During each visit, a Schaeffler field service engineer takes vibration measurements to identify any deterioration of the rolling bearings and gears. These measurements are made and stored using Schaeffler’s FAG Detector III handheld vibration monitoring device. 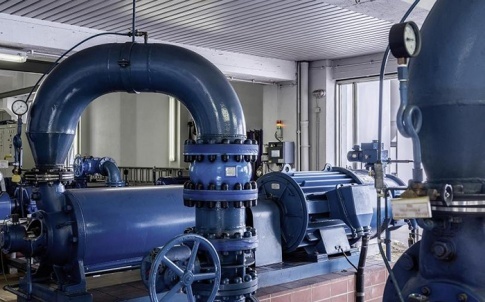 With its built-in software, ‘Trendline’, which includes a database of more than 20,000 different bearing products from different suppliers, this device enables the user to collect, store and analyse vibration measurement data. 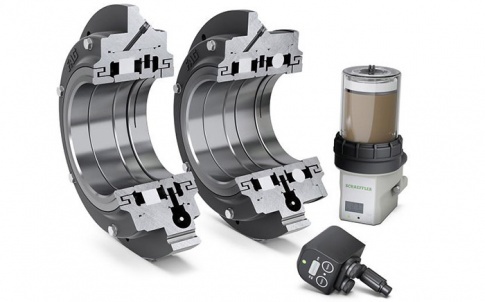 Used in combination with the data viewer, the bearing database is ideal for assessing a machine’s condition. For example, up to four different characteristic values can be stored and displayed against one measurement point (several defect bearing frequencies can be checked efficiently using a single measurement point). 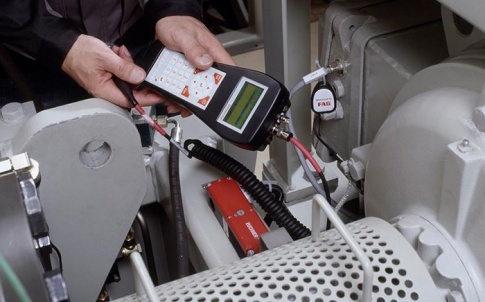 The FAG Detector III is used to measure and record vibration data at each selected measurement position on the crane gearboxes. The three basic measuring parameters are velocity (a measure of overall machine vibration that responds to mechanical issues such as imbalance, misalignment and looseness), acceleration (typically used to monitor gear defects and progressing bearing defects) and enveloped acceleration (a measure of high frequency, impact-type events, typified by early bearing or gear faults). Velocity, acceleration and enveloped acceleration measurements are typically taken with the drive motor running at its normal operating speed during lifting and lowering movements of the crane. At each measurement position, four separate measurements are taken under the following load/movement conditions: unloaded-lifting, unloaded-lowering, loaded-lifting, and loaded-lowering. 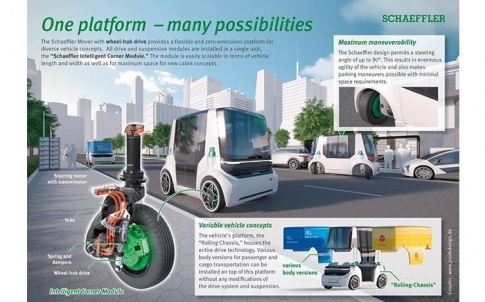 The measurement data is then analysed by the Schaeffler field service engineer, who then writes an analysis report and recommended action list (if this is required) for the port operator. The report typically includes an ‘Acceleration Trend’ plot (see example below) that shows alarm limits (red and yellow lines) and how the acceleration data for the gearboxes has varied over time (from 2012 to 2015). In 2014, the red line in Fig 1. (see below) indicated that an alarm level had been reached, indicating possible damage or wear of the gears. 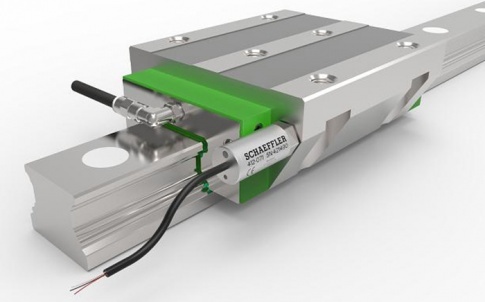 At ‘no load’ measurement positions in particular, the Schaeffler field service engineer also noticed that these were producing larger vibrations. This was due to backlash/clearance in the gears. 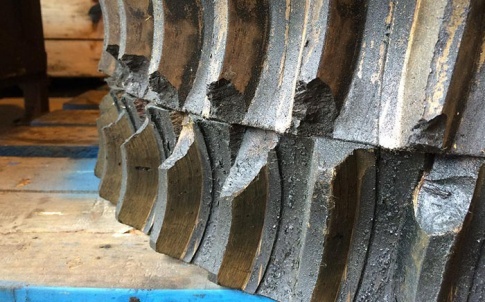 Large variations of how vibration travelled through the gearboxes and motor were also identified, but these were affected by structural resonance, ambient temperature and oil/grease temperature. Schaeffler recommended that the gears were refurbished, which resulted in a corresponding reduction in mid-2015 of gearbox noise and vibration to a normal acceptable level. Schaeffler UK is continuing to provide vibration monitoring and analysis services on an ongoing basis to the port operator.